Sleep apnea made headlines in February when the National Transportation Safety Board concluded that engineer fatigue resulting from undiagnosed sleep apnea caused 2 serious commuter railroad crashes. One crash, in 2016 on the New Jersey Transit railroad at Hoboken, New Jersey, killed 1 person and injured 110. The other, in 2017 on the Long Island Rail Road in Brooklyn, New York, injured 108. Sleep apnea is a disorder in which patients repeatedly stop and start breathing during sleep, causing them to awaken partially. The most common form of the disorder is obstructive sleep apnea, which is caused when relaxation of the soft tissue in the back of the throat blocks the passage of air. Less common is central sleep apnea, which is caused by irregularities in the brain’s signals to breathe. Sleep apnea often causes excessive daytime sleepiness, which is linked to other types of accidents besides those on the railroad. One study found a 2.5-fold increased risk of motor vehicle accidents in patients with obstructive sleep apnea. Another study showed that workers with obstructive sleep apnea have nearly 2-fold increased odds of being involved in a workplace accident. As a public service, we conducted a study to learn more about recent trends in sleep apnea in the United States. Analyzing data from our database of over 25 billion privately billed healthcare claims—the largest such repository in the country—we studied claim lines (the individual procedures listed on insurance claims) associated with sleep apnea diagnoses. 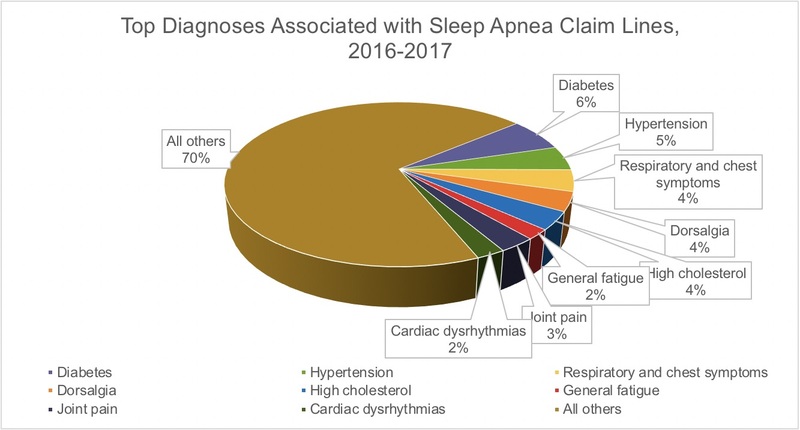 We found that sleep apnea claim lines increased 850% across the nation from 2014 to 2017. The increase was particularly high in rural settings—911%—while in urban settings it was 839%. Rural diagnoses of sleep apnea grew from 0.2% of all rural medical claim lines to 1.98%. In urban settings, the increase was from 0.13% of all urban medical claim lines to 1.27%, and nationally, from 0.14% of all national medical claim lines to 1.33%. Men are generally considered to be more likely to be diagnosed with sleep apnea than women. Our research confirms this pattern. 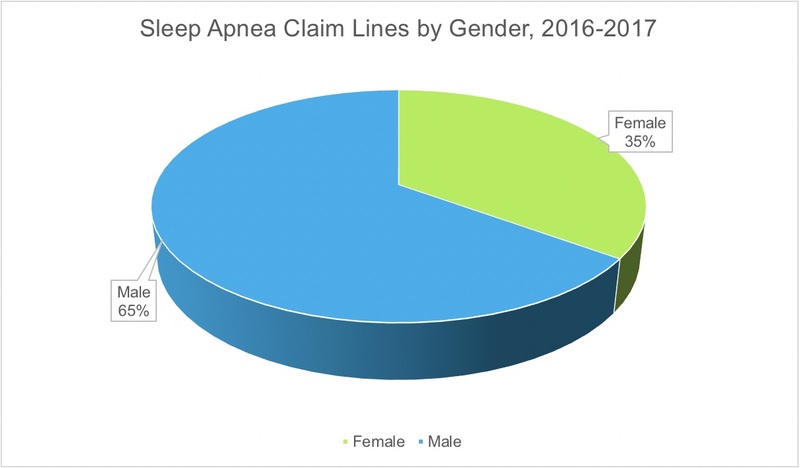 In the period 2016-2017, males accounted for 65% of sleep apnea claim lines, females 35%. Being middle-aged or older is often considered to be a risk factor for sleep apnea. 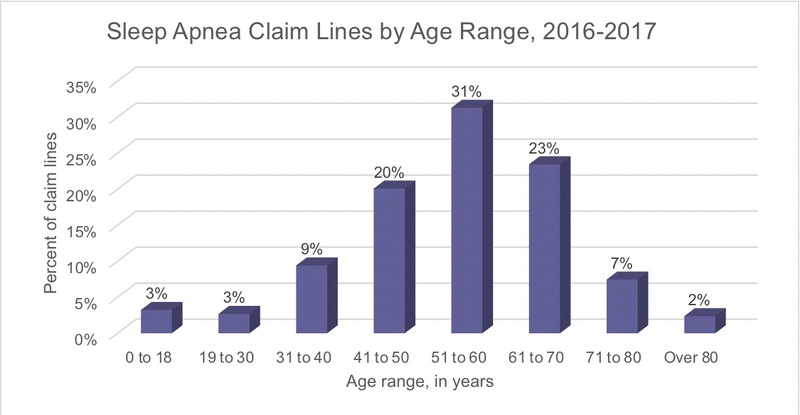 Again, studying the distribution of sleep apnea claim lines in the period 2016-2017, we found that the peak age range was that of individuals 51 to 60 years old, who accounted for 31% of claim lines. Patients 61 to 70 years old were second, representing 23% of claim lines, and those 41 to 50 years old were third, constituting 20% of claim lines. Sleep apnea is known to put patients at risk for other medical conditions. We investigated the other diagnoses most commonly associated with sleep apnea claim lines. In 2016-2017, the most common such diagnoses included diabetes, hypertension, respiratory and chest symptoms, dorsalgia, high cholesterol, joint pain, general fatigue and cardiac dysrhythmias. Headgear used with positive airway pressure device. 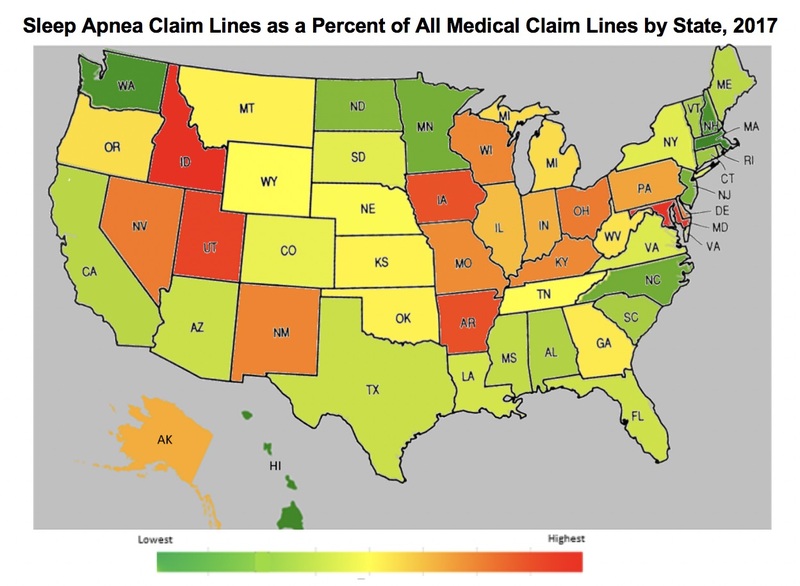 The state-by-state distribution of sleep apnea claim lines as a percent of all medical claim lines by state changed from 2014 to 2017. The two heat maps below show states with greater prevalence of sleep apnea diagnoses at the red end of the spectrum, and lower prevalence at the green end. The 2017 map shows a marked increase in states near the red end—that is, with greater prevalence of sleep apnea. From 2014 to 2017, the states with the greatest and least prevalence of sleep apnea changed. 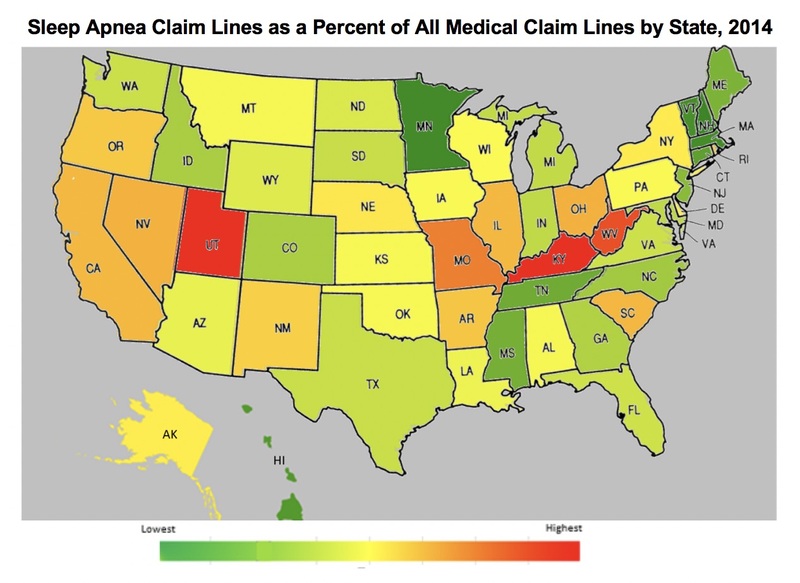 In 2014, the 5 states with the most sleep apnea claim lines as a percent of all medical claim lines were (from most to least) Kentucky, Utah, West Virginia, Missouri and Ohio. In 2017, that list was Maryland, Idaho, Utah, Arkansas and Iowa. Only Utah appeared on both lists. In 2014, the 5 states with the least sleep apnea claim lines as a percent of all medical claim lines were (from least to most) New Hampshire, Minnesota, Massachusetts, Vermont and Hawaii. In 2017, they were Massachusetts; Hawaii; Washington, DC; New Hampshire; and Washington. In this case, the 2 lists shared 3 states: New Hampshire, Massachusetts and Hawaii. Our study suggests that sleep apnea is a growing national concern. We hope our data will be a valuable starting point for researchers, policy makers and others to address this public health issue. Click here for a graphic on sleep apnea. Robin Gelburd, JD, is the president of FAIR Health, a national, independent, nonprofit organization with the mission of bringing transparency to healthcare costs and health insurance information. FAIR Health possesses the nation’s largest collection of private healthcare claims data, which includes over 25 billion claim records contributed by payors and administrators who insure or process claims for private insurance plans covering more than 150 million individuals. FAIR Health also holds separate data representing the experience of more than 55 million individuals enrolled in Medicare. Certified by CMS as a Qualified Entity, FAIR Health receives all of Medicare Parts A, B, and D claims data for use in nationwide transparency efforts.